… if you live rurally outside London you will know that the garden centre is the social hub of the wider community… it is the epicentre of rural life and most garden centres are to us what shopping malls are to the urbanite… a place to purchase plants yes but oh so much more. There are two garden centres not far from Belleau in opposing directions; one is part of a small but nationwide chain, the other is an independent but nevertheless quite established establishment. The one that is part of a nationwide chain is very nice – the prices are lower and there is a lot to offer. As well as plants is has tools, sheds, garden furniture, pet goods, indoor plants and a wide array of nick-knacks such as stationary, cards, candles etc – it also has a decent cafe. It’s popular and it’s all very nice. The independent garden centre is like stepping into another world. If it belongs outside, or is outside adjacent then this garden centre stocks it… and more. Plants yes but it’s like walking through a magical kingdom of stuff to do at the weekend… live fish, furniture – both indoor and out, clothing, jewellery, pet-goods, an amazing kitchenware department and at Christmas it has the most outrageous display of lighting, decorations and stuffed polar bears you can imagine. You could easily take the kids here for the day out! There’s a maze, trampoline park and 2 cafes. They even have an animatronic dinosaur exhibit which is relatively believable if not a little dusty… The Viking and I visited at the weekend to purchase some plant or other but of course two hours later and we left with random goodies for the cottage… and of course everyone and their mothers are there, literally it seems like families come and try and lose their relatives amongst the displays of realistic animal statues… 10ft stone gorilla anyone? 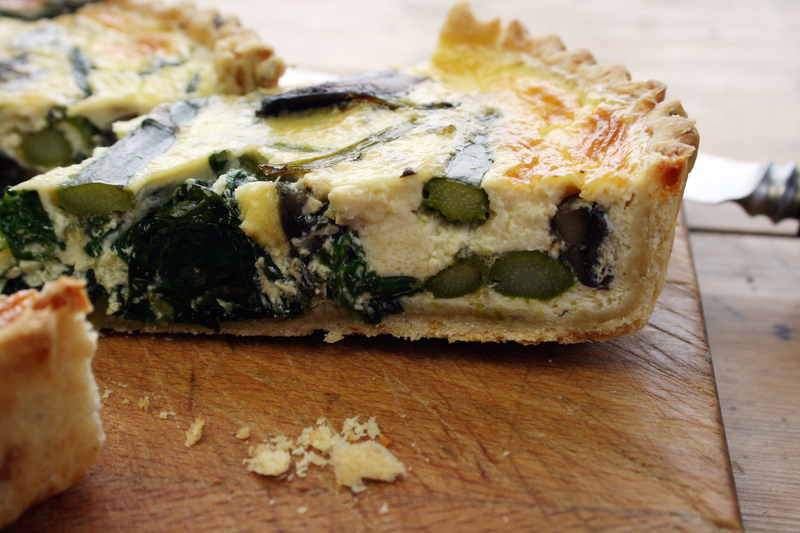 another favourite for this time of year, the asparagus and wild garlic just work so well together and with the richness of the added mushrooms this is one hell of a quiche… we’re lucky enough to have a very large valley in a secret corner of the countryside that is awash with wild garlic. It’s quite phenomenal and so I have no qualms about pilfering a handful but please do try and get permission from the landowner if you can and don’t take any more than you need. I’ve chopped fresh chives into my cheddar shortcrust and it’s worked superbly well… and definite pastry favourite. This quick was served for brunch as well as a quick grab breakfast over the weekend. once your pastry is pale gold, take it out of the oven and set aside whilst you beat the eggs into the creams – season well. carefully tip the mushroom, asparagus and wild garlic into the pastry case – I do this by hand to get an even arrangement and the mushrooms are usually cooler by this time, finally pour the cream egg mix all over and bake on 160C for about 15-20 minutes until golden and risen, set aside on a wire rack to cool. The quiche should easily slide out of the tin. Yum! 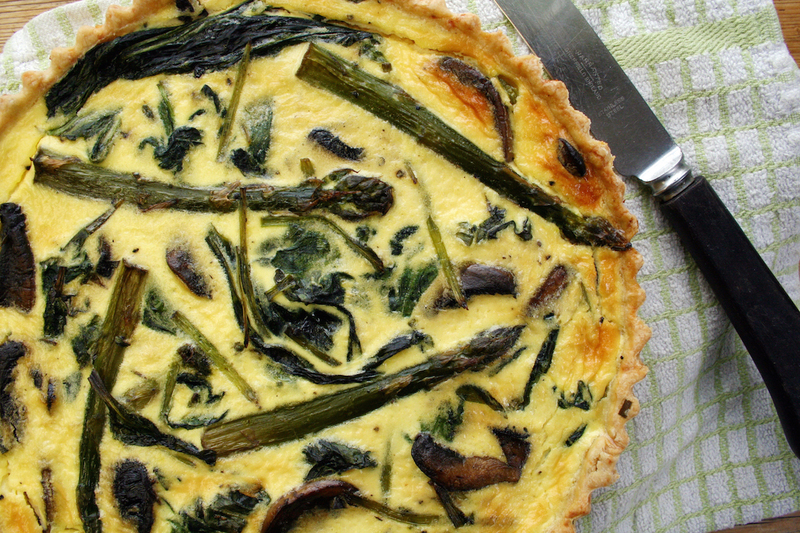 Our quiche this week was rainbow chard, purple onion, and asparagus! Huzzah! Spring is here! Love your use of the garlic greens! Mmmmmm … .I really liked this. My favorite is the use of garlic, but I also like the asparagus quiche! Powerful that quiche may be, but I can't help thinking that it would be even better served with a couple of rashers of crispy bacon!! (Sorry). So different to mine Dom, but so gorgeous. 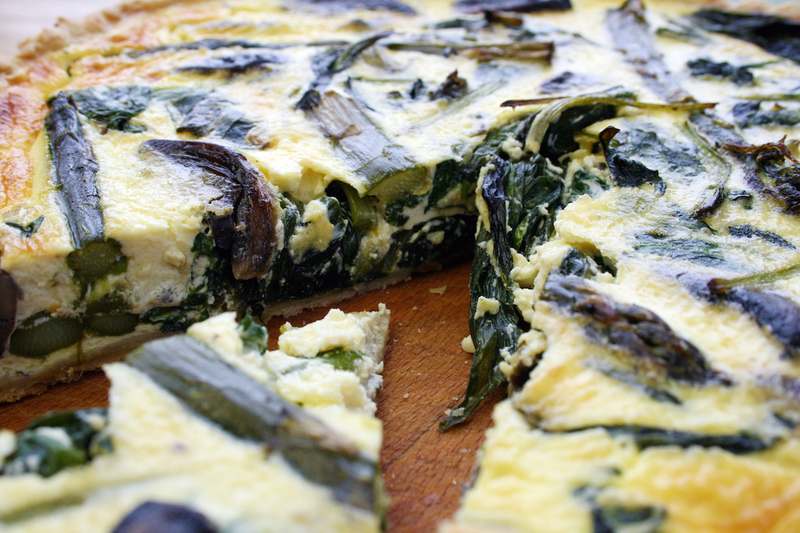 Love your use of the whole wild garlic leaves and mushrooms usually make most things better. Loving the sound of that cheesy short pastry. Quiche looks yumo! One of our favourite walks with Lulu takes us through woods where there are huge swathes of wild garlic and it's all ready now for picking. 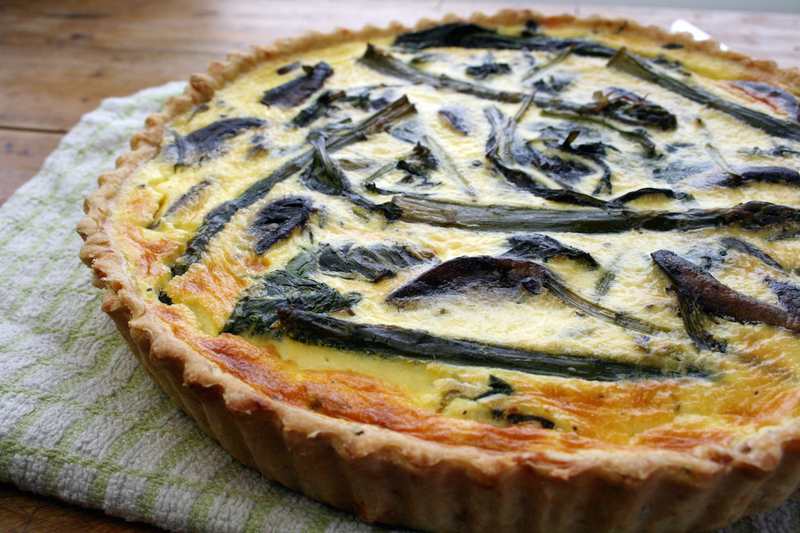 Your quiche looks wonderful and delicious, I shall gather some leaves and get some asparagus today! oh that's so great that you're now growing your own! I can come an pilfer yours now!! oooh, rainbow chard… I need to purchase! they are so much like omelettes… I do make them without the pastry too. Lovely! Thanks C… oh those mushrooms! Thanks jean… I just adore the aroma as you walk into the woods! That quiche looks heavenly! Can't go wrong with a trip to a garden centre.